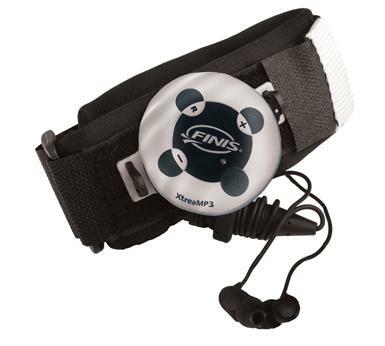 The Finis XtreaMP3 waterproof MP3 player is designed for all watersports activities. Imagine listening to hours of your own music while you surf, swim, kayak or just get wet. The Finis XtreaMP3 waterproof mp3 case and earbuds allow you to get in the water without leaving your favourite songs behind. Take your music anywhere with the durable and completely submergible XtreaMP3 player. The shockresistant and skip-free waterproof MP3 player can plays up to 240 songs with its 1Gbyte of memory. The small XtreaMP3 player attaches to a comfortable neoprene arm strap, allowing you to enjoy your favorite music hands free. Specialized waterproof headphones secure tightly to the ear canal making for clear listening in any environment. Waterproof up to depths of 15 feet or 4.5 meters.